A kilo or so of small lebanese cucumbers that were not going to last the weekend landed in my possession, courtesy of some leftovers at Fareshare. I hate waste, so I used them to make some pickled cucumbers. I’d got the idea to do this after my sister-in-law brought some to a family dinner. It has taken me an age to publish this post. I wrote it in March and forgot about it. Here it finally is. 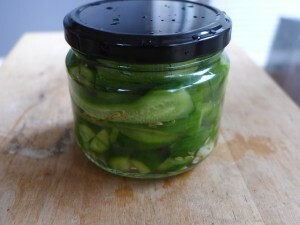 These pickles need to be stored in the fridge as they are not sterilised by heat. But I like them better this way as they retain more of their crispness. It also means that they can have less vinegar than a stored pickle, which I also like, as they are not so tart. They will last several weeks in the fridge. The important part is to get the ratio of vinegar to water right so they preserve. Everything else is really to taste. The right ratio is about 5 parts vinegar to 3 parts water. I needed about 2 cups in total. I used this mix and then added enough sugar to take the edge off the vinegar and seasoned with salt, thinly sliced garlic, black peppercorns, fennel seeds and fresh dill. That’s it. Wash and prepare the cucumbers. I sliced mine in quarters lengthways. 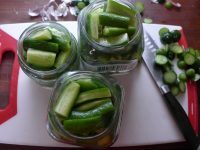 Pack the cucumbers tightly into clean jars. 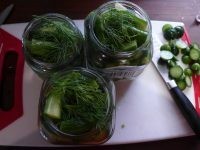 Add peppercorns, fennel seeds, garlic and dill to the jars. Pour the hot liquid into the jars until they are brim full. Screw the lids on tightly.